Logan has been a part of Rainbows for 13 ½ years now, and currently receives Targeted Case Management services. In the past, he received home visits from Rainbows’ professionals for occupational therapy, physical therapy, speech and also worked with a Special Education teacher. 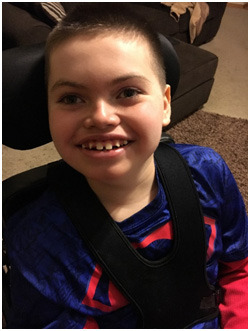 When Logan was first diagnosed 13 ½ years ago, we did not know what to do or where to go. Our pediatrician suggested that we call Rainbows United. A team came out to evaluate Logan and suggested what they thought he needed. It was wonderful! They were patient and kind and were understanding with all the questions we had for them. Since that first phone call, Rainbows has been a part of our lives. Targeted Case Management (TCM) has impacted my family by letting us know what is going on in the community and keeping us up to date on changes. Emma Lowe, our current Case Manager, lets us know about funding that could help with equipment. Without TCM, we would not have received the necessary funds to purchase vital tools for Logan. Rainbows has helped our family during one of the most challenging times of our lives so far. Rainbows shows us that even with devastating diagnosis there is always hope. Logan has the sweetest smile. He might not be able to speak words, but when he looks at you and smiles you can hear just how much he loves. We have never given up on Logan, and I don’t want others to give up on him either. He has always defied the odds against him, and I hope and pray he continues to do so. Proceeds from this year’s Blarney Breakfast will go to purchase a harness and tether kit so Logan remains safe in his family’s vehicle.